Get your groove on and keep the party hopping with a portable dance floor from The Caterers, Inc. of Las Vegas. 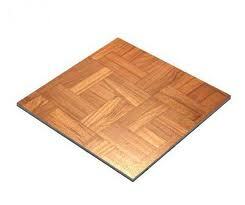 Our sturdy wood finish dance floors come in 3′ x 3′ sections. We recommend a minimum dance floor size of 12′ x 12′ but that is up to you. You may be able to determine how many 3ft x 3ft pieces you need by the space you have available or by the number of people attending your event.